Last month I talked about some of the history of how we've come to believe that fat is bad and that fat makes us fat. If you haven’t read the blog – spoiler alert – those claims are false! I will readily admit there's a lot of debate that goes on about nutrition. It’s important to consider the source and who has paid for the studies. Prior to the 1950s (before the science on fat was perverted), it was common knowledge that carbohydrates were not very healthy for you especially when they came in the forms of sugars and breads. People ate fat and were slimmer that they are today. Why do we care so much about fat? And as someone who coaches many Alzheimer's patients, fat is extremely important for cognition! But is all fat good for us? Simply put, no. Like most things that deal with food it's not black and white. So let's explore this a little. First let us define what "fat" is. To do that I need to get a little “sciency” first, but I will try to keep it simple. 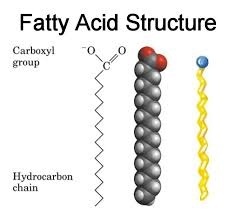 In chemistry terms fat is really "fatty acids". Saturated: a saturated fat has zero double bonds and the term saturated comes from the fact that it is saturated with hydrogen. Within the saturated fats category there are additional types which are laurate, myristate, palmitate and stearate. Saturated fats are the most stable fats and this stability also makes it an ideal fat for cooking. Sources for Saturated fats can be found in coconut oil, grass-fed, organic meat/animal protein, butter, ghee, cheese, and pasture-raised eggs. The benefits that come from eating saturated fats are that they help provide stiffness and structure to your cell membranes and tissues, they help you make hormones such as testosterone and estrogen, they suppress inflammation and help strengthen your immune system (among other benefits). Make sure you get good sources for the saturated fat that you use, like grass-fed organic meat. The takeaway here is that these fats can be extremely beneficial to you. However, most of the dietary experts out there agree that monounsaturated fats are good for you. Sources for monounsaturated fats are avocados, olives, olive oil, lard, nuts, and certain types of fish. The benefits to your body can range from cardiovascular health and improved insulin sensitivity to less risk of blood clots and stroke. As a general rule you want to be eating foods that are not processed in any way or processed in the least way possible. You may also know polyunsaturated fats by the other names that we use to describe it, which are omega-6 and omega-3 fats. These are considered to be key to our survival. So if they are critical for us should we be concerned that they are also an unstable fat? The answer is that polyunsaturated fats can be very healthy for you with one caveat. "You should just handle less stable fats more carefully to make sure they don’t oxidize or spoil. That means avoiding ones that are heavily processed or exposed to high heat. "[v] In general, it's not a good idea to cook with them especially at a high heat. Oils break down at a certain temperature, which is known as their "smoke point”. Sources for polyunsaturated fats are soybean oil, canola oil, safflower oil, sunflower oil, flax oil and fish oil. Additionally, walnuts, fish and seeds (sunflower, pumpkin, sesame, etc) are good polyunsaturated fat foods. Again, I want to stress that not all of these sources are considered to be good sources. Canola oil, which was mentioned above as a monounsaturated fat also contains polyunsaturated fats. Canola oil is not considered a healthy fat because of the processing that I spoke of earlier and due to its high omega-6 content. As I said earlier omega-3 fats and omega-6 fats are essential to our survival. We can't completely cut these fats out and instead just need to be more educated about how to handle them and what the best sources are. Omega-3 fats make up much of your cell membranes and regulate insulin function, inflammation and even your neurotransmitters. This is why they are critical for preventing and treating diabetes, depression and arthritis. And while most Americans are deficient in omega-3 fats, you do have to watch how much omega-6 fats you do eat because they can be inflammatory. Sources for trans fats are hydrogenated fats, which are found in margarine, shortening and processed foods as well as fried foods and highly processed cakes, cookies, doughnuts, pie crust, frozen pizza, etc. Trans fats are linked to cancer, obesity, insulin resistance, and increased heart attack risk. For those of you who have been on a low fat diet, I encourage you to look a little further and try adding healthy fats to your daily consumption. Many of my clients have felt so much better when they added some healthy fat to their meals. Have you noticed improvements in your health when you have balanced your fat intake? Do you think that some of your fatigue, tiredness, and ill help could be due to a lack of healthy fats? I encourage you to talk to your doctor and see if it would be helpful in your situation. In the meantime, I can suggest some reading materials on the subject. What is Dr. Hyman's Eat Fat, Get Thin, another is Smart Fat by Masley and Bowden and a third option would be to look at the Bulletproof Diet by Dave Asprey. In the New Year let's make sure you start off with an optimal intake of fat!